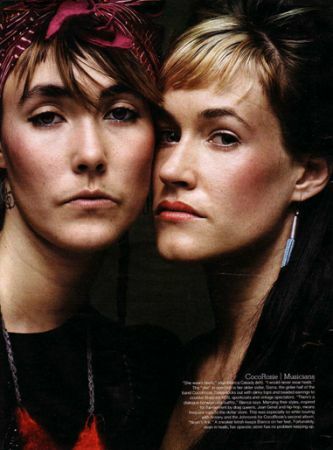 CocoRosie/Musicians – Photographed by ROBERT MAXWELL – image scanned from THE NEW YORK TIMES STYLE MAGAZINE – WOMEN’S FASHION SPRING 2006. BIANCA CASADY (left) and her older sister, SIERRA, are the NYC Indie cult band of the moment. They recently toured with ANTONY AND THE JOHNSONS, to introduce their 2nd album, ‘NOAH’S ARK’. BIANCA CASADY aka RED BONE SLIM opened ‘RED BONE SLIM VS. ITSELF: An Exhibition of Drawings’ on March 9, 2006, in the AFF Storefront, 123 Ludlow Street on the Lower East Side. … “these drawings trespass through themes of gender/race disphoria and familial roles .. to the meditative psychadelia of possession states and third eye travel”. RED BONE SLIM’S past shows include ‘Yo mire un garza mora dandole combate a un rio’ – a group show curated by DEVENDRA BANHART at the ATELIER CARDENAS BELLANGER in Paris, September 2005 & another DEVENDRA BANHART show at ROTH HOROWITZ in NYC, in December of 2004. SLIM’S work can be seen on the album sleeves of CocoRosie’s ‘La Maison de mon Reve’ and ‘Noah’s Ark’ – as well as on the cover of the Voodoo-EROS compilation ‘The Enlightened Family’. The opening was amazing – a kind of modern day Freida Kahlo meets THE THIRD EYE and gets rid of that boring mural painter boyfriend. Even Antony, of Antony and the Johnsons, who has so much charisma in person it is unbelieveable, showed up, in the final minutes. There were sparse strings of colored lights & fragile colored tissue paper cut-outs of mysterious symbols adding to the festive, but charged & low-key ambience.